I was contacted by Matthew Kenyon of Game Paused on 5/22/13 in regards to a video games fan art book he was putting together via crowd-sourcing. This sounded like an awesome project and he was interested in featured my custom video game themed Munnys. So I sent him some options and low and behold, Birdo Bub made it into the “Everyday is Play” book! Tenacious Toys featured my Mario Galaxy Mega Munny! In January I decided to enter the Modern Myth “The Bindlestiffs” DVD artwork into the 2011 Graphic Design USA (magazine) Package Design Awards contest. I felt very excited about the design, and figured I might have a shot at winning something. Low and behold, weeks after entering, I received a sturdy cardboard envelope that had a letter and certificate confirming that the design DID in fact win an award! If you have a subscription to GD USA, keep an eye out for the next issue. If you don’t have a subscription, subscribe now…it’s free! Otherwise, it should be featured on www.gdusa.com in March. And just in case you’re intrested, “The Bindlestiffs” DVD is available to purchase at www.thebindlestiffs.com. 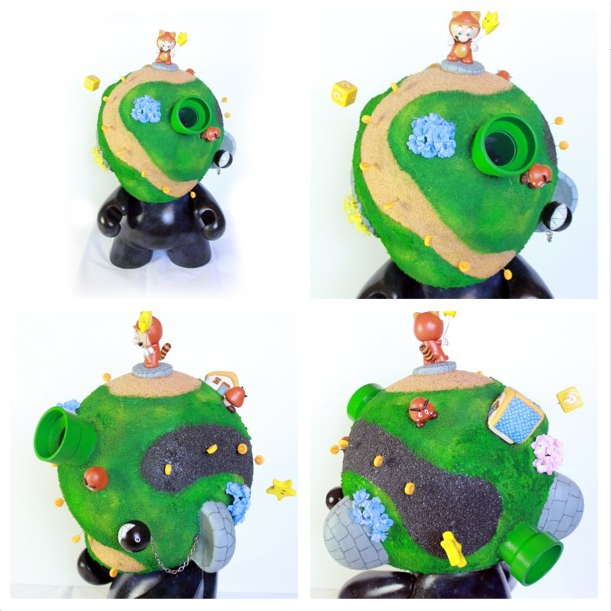 It has been almost a year since I’ve worked on a Munny, and just a few days after completing the Hot Air Balloon, the Kidrobot KRonikle blog featured it their MUNNYWORLD Highlight on 3/16/11. I received an email via Flickr from Andrew Hayward, a contributing editor for Nintendo Power magazine. He came across my Wind Waker Link Munny and was interested in covering it in the Community section of the magazine. I’ve been a subscriber to the magazine for years, so OF COURSE this was excited! It felt like forever before the March 2011 #265 Issue of Nintendo Power came out. On 3/1/11 I rushed to a book store to see it in real life on Page 95. One of my biggest highlights of the year, for sure. As I was testing meta tags for this site by Googling my name, I stumbled across some blogs that were featuring my Link Munny! I’ve been making custom Munnys for a little while and was really excited to find out that Kidrobot was hosting a Munny Month contest. I decided to enter two Munnys. One came with a fancy hat so I wanted to make a Justin Timberlake inspired GQ Munny. Another I wanted to do something I’ve never seen before….replace the head of a Munny for a fishbowl, and put an ACTUAL fish in it. Then It could be holding a fishing pole with a lure as if he was fishing for his own brain. After 800+ entries from around the world were judged by a celebrity panel, results were in. GQ Munny won First Place in the Best Hipster category (I didn’t even know that WAS a category), and Fish For Brains won Third Place in Best Ingenuity (what I was aiming for). Winning entries can be viewed here (although I think the link might not be working properly). I can’t wait for the next contest!